Clinicept® Alcohol Free Disinfectant Wipes are highly effective and proven Bactericidal (EN 1276, EN 13727), Mycobactericidal (EN 14348), Fungicidal (EN 13624) and Virucidal (EN 14476). The product uses a strong, high performance wipe fabric and an Alcohol Free formulation. 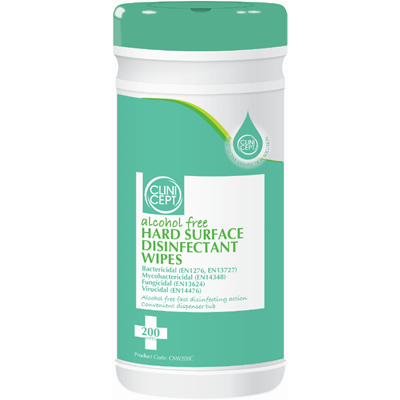 The wipes are ideal for use in Hospitals, Nursing care homes, Food preparation areas, Laboratories, Optometrists, GP Surgery tables, Veterinary surgery tables, Trolleys, Phone disinfecting and many more applications. We would like to hear about potential UK & International trade opportunities for Clinicept® Alcohol Free Disinfectant Wipes. If you are interested in distributing this product, please click here to contact us by email.